Ben's presentation was the first of many which converged on the idea that by making things more accessible for some, we end up making them better for everyone. It doesn't even have to be intentional. One example is closed captioning; what started as an aid for the hard of hearing has been discovered and used by people in noisy environments, people with sleeping children and people on mobile phones. Monkigras was itself live captioned and the big screen by the stage itself proved useful to all as everything was transcribed to it. Speaker after speaker gave examples of how the idea of accessibility improvements making things better for all worked. Alex Chan's talk looked at curb cuts. These ramps between the road and the pavement have become a standard thing in urban life, so it may be surprising to find how they only initially appeared with an eye to assisting disabled veterans in the 1940s. The simple curb cut made life easier for the disabled and as Alex points out, for anyone who wanted to move between the road and the pavement. In doing so it made the environment better for everyone. Alex showed this isn't a one-off either, it happens again and again. The talks opened up to the wider issues that face accessibility. Rachel Stephens looked at how to build the business case given the difficulty of measuring the benefits of accessibility. Thomas Otter showed the results of a study of career sites. The data showed how the bad design and accessibility of forms on those sites made it much much harder for people using assistive tools to even complete the job applications. It was then to lunch but not before an unscheduled talk at the intersection of Monkigras themes. Jane, the founder of all-female brewery Mothership Beer, talking about how they set out to champion women in craft beers. The afternoon's talks opened with Joe Drumgoole looking at how accessibility in software was only part of the solution. While many impairments are visible, there is a whole range which are not and they can profoundly affect how an individual interacts with the world. 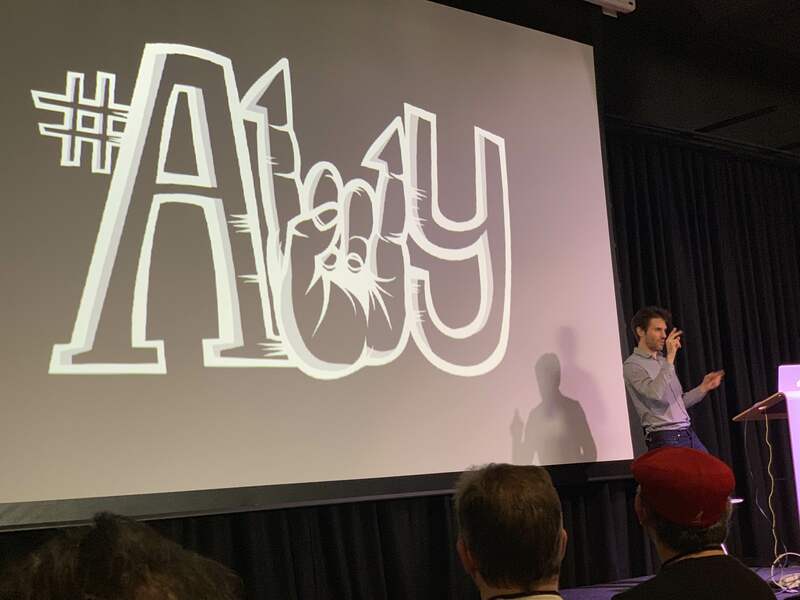 It's these psychological deficits and their challenges that designers need to address by putting the humanity - the H8y numeronym to go with the A11y of Accessibility - into their design and development processes. The day continued with talks on making musical instruments accessible, making coding accessible to young people, managing chronic illness and representing diversity in visuals. The why and how to create a workplace culture that supports all, not just the vocal, senior employees, was the subject of Steph Johnson's talk, which drew on her experience as a person with Tourette's syndrome, of what it takes to enable everyone to be themselves at work. 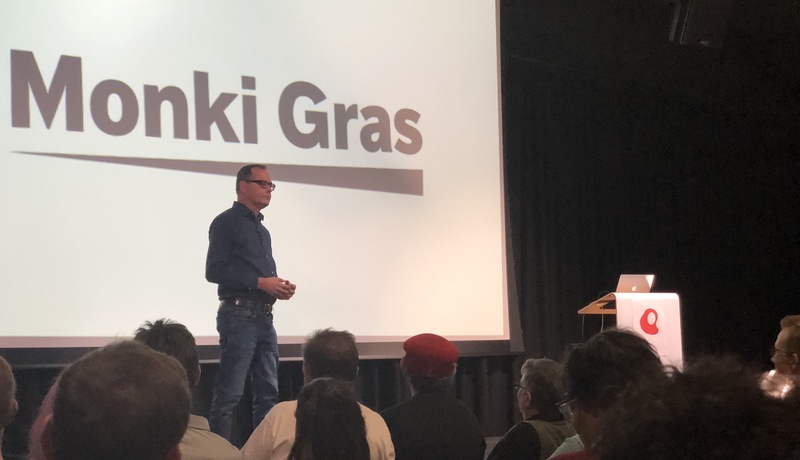 The second day's talks wrapped up with a presentation from the people doing the conference's captioning, White Coat Captioning, and a look at Andiamo, a project to 3D print custom orthotics for children which started as an idea at Monkigras 2013. The day itself wrapped up with workshops for signing, making accessible websites, time with Andiamo's toolchain, and an introduction to captioning from the captioner's point of view. Each Monkigras sets one up to look at things from a different angle and Monkigras 2019 was the same. Everyone was given the chance to look at the craft of software through a wider lens of accessibility as the starting point for creating future applications and solutions. It was an inspiring two days and MongoDB is pleased to have supported it. And, seriously, you won't find finer food and drink for all at any other conference.